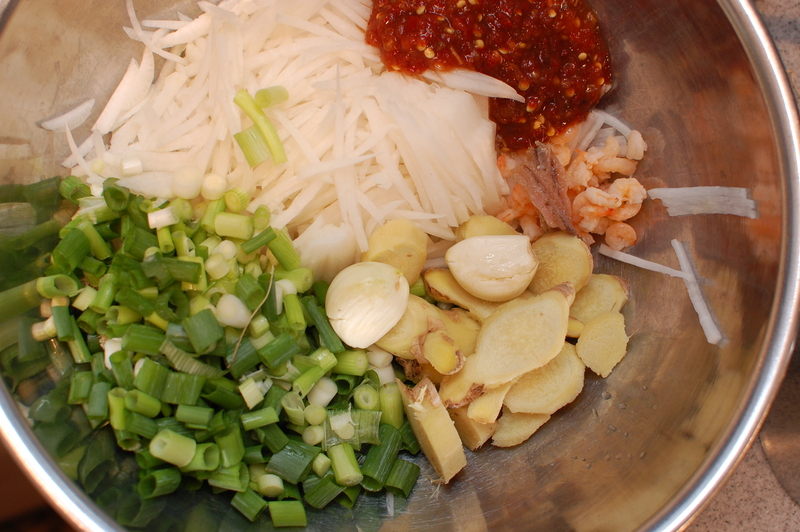 Cooking Up Some Kimchi - You're Making a Mess!You're Making a Mess! Kimchi is a controversial dish around my house. 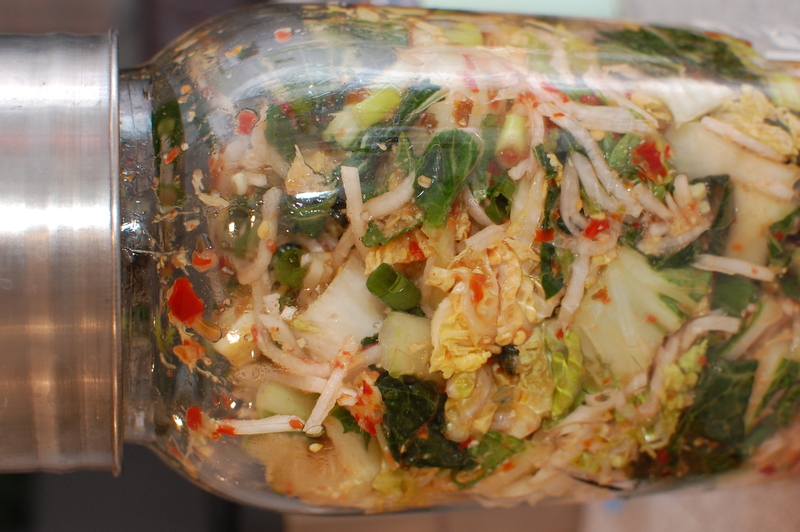 It all started about 4 years ago — the first time I attempted homemade kimchi. You see, kimchi, more than just about any other food I know, seems to be designed from the beginning to to be pungent. 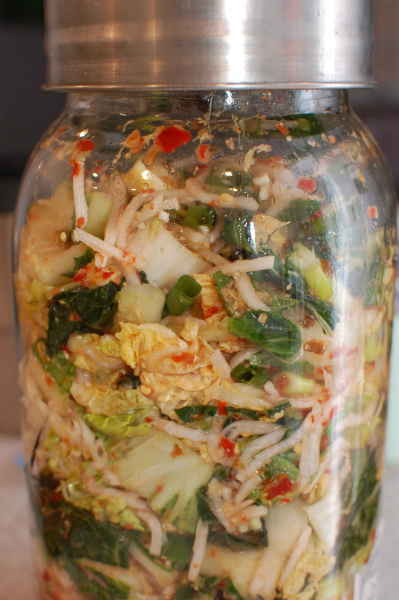 Start with cabbage, no olfactory picnic on its own, and add in fermented shrimp, fish sauce, anchovies, green onions, and garlic. As if that weren’t enough, take all of these ingredients and let them sit at room temperature for about a week. The result is, well, unique. Four years ago, I set out to make a batch after receiving a huge head of cabbage in our weekly farmers box. I took the biggest vessel we owned — one of those plastic cereal Tupperware containers — and filled it with the ingredients. Let’s just say I learned one thing over the ensuing week, and another over the ensuing year: 1) Tupperware cereal containers are not airtight or aroma-arresting; 2) Tupperware cereal containers hold on to certain flavors for a long time. We (well, I, since the wife refused to go anywhere near the container) were eating kimchi-infused Kashi for months. OK, so after a lead-in like that, I’m sure I have all the readers hooked. 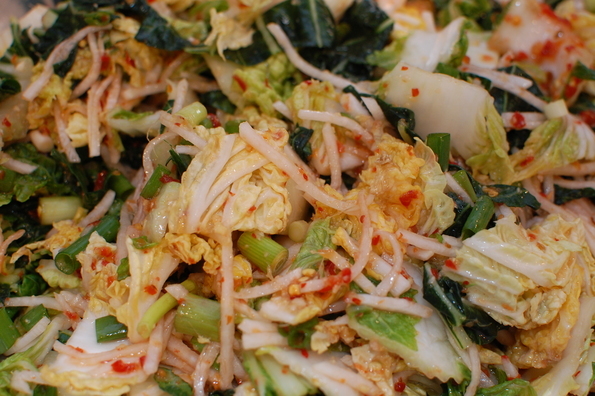 So why bother with a dish like kimchi? The simple answer is that there’s really nothing like it. In Korea, it’s said that 95% of the population eats it daily (40 lbs per capita per year), and families make literally tens of pounds of it at once to last them months. Once you get used to it, it’s easy to see why — kimchi has an addictive crunchy, garlic-y, umami, spicy, sour tang that adds an incredible kick to a wide variety of foods. Kimchi fried rice is a slam dunk (try it with a sunny-side up egg), but it’s also just the trick to punch up eggs, tacos, steak, or anything in need of a little flair. In a lot of ways, it’s kind of like a crunchy hot sauce with a lot of character. In the jar — where the magic happens! The health benefits are amazing too — it’s said to be one of the healthiest foods around. The natural bacteria, lactobacilli, are the same as those found in yogurt, and keep your gut functioning properly. It’s also filled with an alphabet of vitamins — A, B and C.
But don’t take my word for it — give it a shot. I used the recipe that I found on Chow.com, but couldn’t get kochukaru (Korean spice powder), so I substituted red chili paste instead. Not exactly the same, and I’m sure my Korean friends would scoff at the switchout, but the taste is still very good. I also found 2 oz of fresh ginger to be way too much, so my recommendation would be to halve that. Once it’s all done, throw it in a big (glass!) jar with a tight-fitting lid, and taste it every few days.